Can art change society? Here’s news of an exciting new community theatre project in Leith which aims to get people asking questions about the world around us. And maybe come up with some answers about how to change it. No theatre experience needed. Just turn up and get involved on Saturday 14 March in St James Hall, 12 St John’s Place. It sounds like a theatrical version of Open Space, which is why Gavin Crichton got in touch with us. Gavin is director of the very innovative ACTive INquiry Theatre Company, who have just secured funding to run Space workshops in Leith exploring what ‘public space’ is and what it should be. People taking part will help shape a brand new piece of theatre for performance in April and at the Leith Festival in June. Anyone who ‘lives, works or plays’ in Leith is welcome to join in. And it is free. And we certainly would be there too if we weren’t already busy with the event for women, Who Cares for the Carers in Pilmeny Youth Centre on Saturday. But our event finishes at 3.30 and ACTive runs from 1-5pm so maybe there’s a chance to get the best of both worlds. When spectators become actors, there is a chance to explore how the play might change reality. This kind of theatre, Theatre of the Opressed, comes from the work of Brazilian theatre artist and activist, Augusto Boal, with pioneering projects influencing politics and legislation in Rio de Janeiro. After all, Leith is twinned with Rio! First of all, can i say thank you to all of you who made it along to last Saturday’s workshop. It was a really interesting day and a great start to the project! If you didn’t manage to make it then don’t worry, you can still be involved in the project. 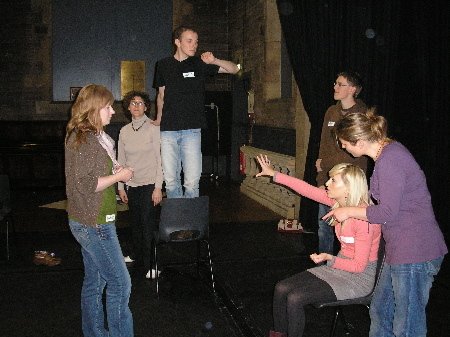 Remember – No previous theatre experience is necessary and the project is free to participants! please get back to me if you would like to be involved further or are willing to host a performance. Please could i also ask that you pass this information on to anyone you think may be interested. If you have any further questions then please don’t hesitate to get in touch.